Most writers just write on assignment. They don’t then subsequently promote their work or the publication that hired them. If an editor or publisher knows you’re going to actively promote their publication after you work for them, they’ll be much more inclined to hire you. But, how do you do that? Here’s my secret (which is no longer a secret) to landing writing gigs when cold-pitching by email. First, you need to figure out who’s hiring RIGHT NOW. These places are probably being inundated with submissions but I’m going to teach you how to bypass the normal application process, and how to stand out above the rest. When you visit these sites, sift through the different jobs until you find the one that is a good fit for you. Find the jobs in categories that you could be an expert on, and/or find the jobs that you will find fulfilling and profitable. Once this is settled, you can get down to cold email pitching. Using the word “content,” I found two decision makers in this company. One of them is the Chief Content Officer and the other one is the Content Manager. My next step is to find their email addresses. Click on their profile, and check for their emails. If you don’t find them, look at their website(s) and chase it down till you find their email or a contact form that will send your message directly to them. If you’re still having issues, step back a little. You’ll usually see a contributing writer to the company when searching for the decision makers. Connect with them, and send them an email congratulating them on a recent article they published. Share the article on your Twitter or Facebook account, and let them know you’ve shared it by including the link in the email you’re sending to them. In the end, politely ask for the email address of the right person to reach out for in working there. Most times, the contributing writer is glad to give you the contact info. Once you’ve got the email address of a decision maker in the company, it’s time to send out some cold emails to pitch your idea. 3. DON’T BE LIKE EVERYBODY ELSE! What we don’t want to do is to apply the way everyone else applies. We want to stand out from hundreds of freelance applicants the clients hear from every day. Since you’re not contacting a clerk or a general email address, you’re already doing this. And, my cold-pitch template below will show you how to avoid being like every other person applying for the job. I must congratulate you for the engaging posts on your blog. I just shared your post, [title of post] ,on my Twitter and Facebook feed and I recommended this blog as a reliable website [insert the shared post link] on that topic. – Craft compelling blog posts with keywords that rank high in Google and other search engines, driving in organic traffic to each blog post while NOT compromising on the entertaining and informative need of your readers. – Generate natural backlinks for each post submitted, also leading to rankings high in Google and other search engines. – Promote each article I submit with paid Facebook advertising a week after submission (at my expense, of course). If you don’t receive a response after sending your proposal, follow up every four business days. Share some of their blog posts on Facebook and Twitter again, let them know you’ve done so in your new email to them, and remind them of your pitch. Usually, within two weeks, you’ll receive a response. 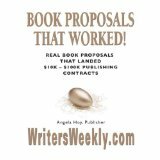 Peek over the shoulders of highly successful freelance writers to see how they earn thousands per article! The query letter is the key! In these pages, you'll find real query letters that landed real assignments for national magazines, websites, and corporations. Your Rights As a "Freelancer"
and ANGELA HOY'S SECRET for finding ongoing freelance work from companies that have a stable of freelancers, yet never run ads for them!